Stop before you put that marinara sauce over your ravioli – there are other options! Here’s a truly delicious alternative and very simple. 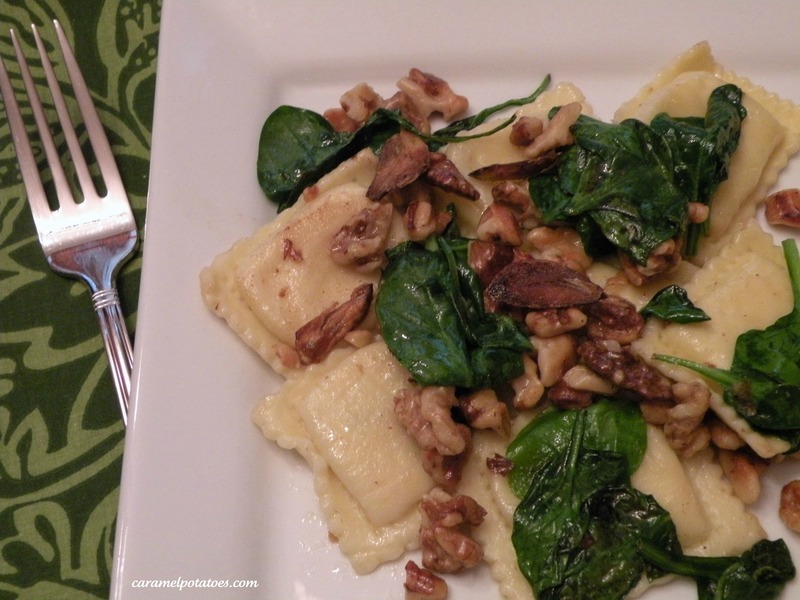 The toasted walnuts are an unexpected, but wonderful compliment to the cheese ravioli. Serve it up with some good bread for a Meatless Meal; or use it as a side to grilled meat. Cook the ravioli according to package instructions and drain. While the pasta cooks, heat the oil in a large skillet over medium heat. Add the garlic and walnuts and cook until the nuts are lightly toasted and fragrant and the garlic is golden brown- about 4 minutes. Add the ravioli to the skillet and toss until coated with oil. Toss the spinach into the skillet and cook just until the spinach wilts. Remove from heat and serve immediately with parmesan cheese sprinkled on top. Serves 4 for dinner, 6-8 as side dish. Great idea! Thanks for linking up at A Little Nosh this week! Yum! Adding this one to the menu for next week! This is so simple, but looks delish! I would have never thought to include the walnuts. Thanks for the inspiration! This looks delicious! I’d love to try this for dinner one day!